You won’t find the residents of Reno or Las Vegas in the massive downtown casinos that attract tourists like those old-school blue light bug zappers hanging from the front porch. Instead if they go out, you’ll find them in the old gambling halls and hole-in-the-wall joints where the payouts are more profitable, and the atmosphere is more authentic. Similarly, during Austin’s annual music festival and conference called South By Southwest, the vast majority of local residents avoid the madness it brings to the city like the plague. For many in Austin, they don’t go to SXSW, SXSW comes to them whether they like it or not. But that doesn’t mean they don’t take the opportunity to participate in the music, and celebrate the local scene that once was about local talent with international appeal, and has now unfortunately become about peddling corporate brands like McDonald’s and Mazda with music as an excuse. On the periphery of Austin are numerous unofficial showcases that either look to take advantage of all the talent that flocks to the city during SXSW, or to offer a more healthy alternative to the madness inside the SXSW blast zone by re-imaging the original idea of SXSW with a local perspective. One such event is called the Spring Fling, hosted by A. Michael Uhlmann, a native of Switzerland who moved to Austin over 25 years ago to cover Austin music. 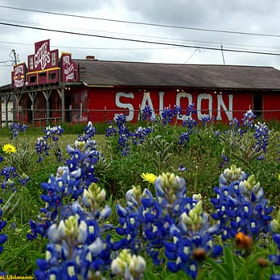 Held at the authentic local honky tonk called Giddy Ups south of town in an area called Manchaca (pronounced “Manshack” by locals), the Spring Fling tries to embody what Austin music used to be. It was called the Decompression Party—to decompress from South by Southwest, and it became the unofficial/official afterparty of the annual gathering. Before then, there were no alternatives to SXSW, and nobody really knew what an unofficial SXSW event was. 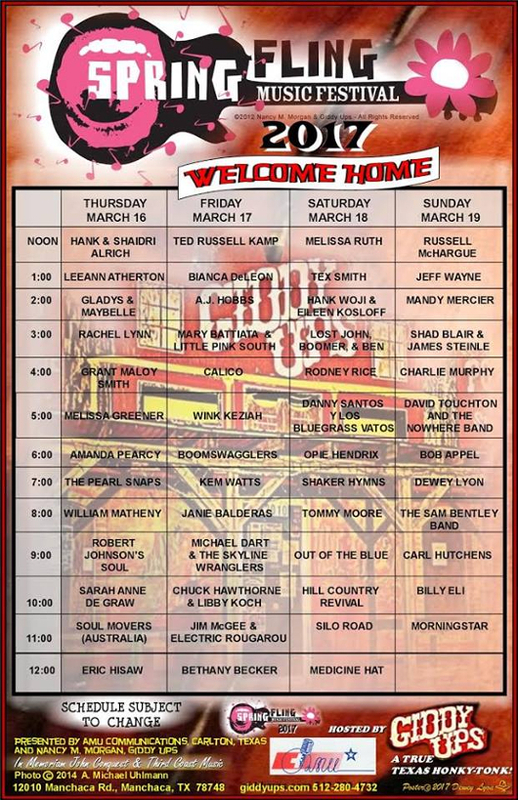 Today a majority of the events that occur around SXSW could be considered unofficial. The Decompression Party also drew the ire of SXSW organizers who early on tried to enact restrictive control over the event—an issue that still persists about SXSW today, and has ironically fueled non-sanctioned events as opposed to restricting the event’s scope and growth. A. Michael Uhlmann came to Austin for three months during the summer of 1989 to check out the Austin music scene, and ended up moving to Austin permanently in December of 1990. He was a DJ for the Swiss Broadcasting Corporation, and had a show called the Lone Star Cafe. He was also a writer for newspapers and magazines, working as a foreign corespondent reporting back to Europe about Austin music. Like many of the refugees of SXSW’s massive growth in the 2000’s, A. Michael Uhlmann was looking for an alternative and decided to start an event of his own. Giddy Ups, like what is left of Austin’s authentic local bars and honky tonks, is a place where the true essence of Austin music can be found. 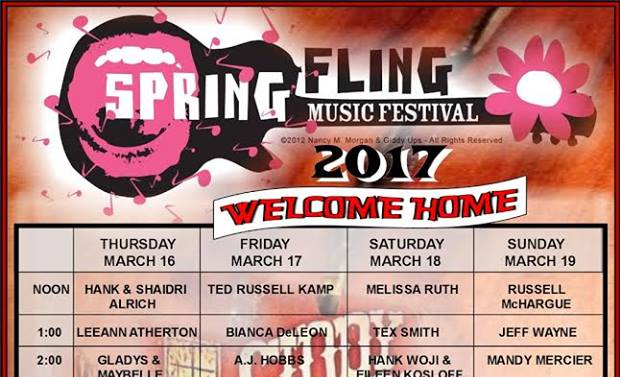 The Spring Fling runs from Thursday to Sunday, featuring music from noon to midnight. Giddy Ups is located at 12010 Manchaca Rd, Austin, TX 78748. **Grant Maloy Smith got stranded in the snowstorm, and Craig Marshall will fill-in. Has there been any word, rumor or indication if there will be a Willie picnic this year? Since the Willie apparatus also puts on the Luck Reunion during SXSW, and that’s such a big event now, they usually don’t get all the details together for the picnic until late in the Spring. I suspect they’ll have one, and I suspect it will be in Austin again at the 360 Amphitheater. Jeff Wayne at 1 o’clock on Sunday? Wonder if he’s unveiling a new country take on his “War Of The Worlds” thing?